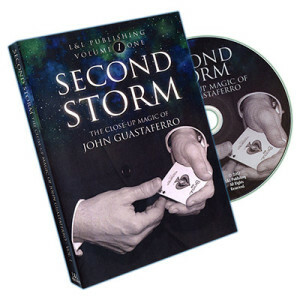 Second Storm includes never-before-seen card and non-card effects, as well as new twists from John’s 2005 lecture notes. Also on this series are John’s exclusive Brainstorm Breaks, where he shares additional ideas designed to spur your creativity. Here’s a great visual opener using nothing more than a pencil and finger ring. It features John’s unique Ring Load and Drop Link. Four “baby jokers” become all grown up in this charming packet trick. Learn how to make the clever gaff in minutes. The spectators help find the four Aces with the push of their fingers. No table necessary; great for strolling. John reveals his stunning Ace assembly, where the Aces completely vanish from their packets and reunite inside the card box. This is the one all the magicians are talking about! Two Jokers inside the card box change places with the spectator’s card. A 52-on-1 card is used as a TV remote to locate the spectator’s selection. A clever take on the ambitious card plot, with a surprise finish. The four Aces demonstrate their mind-reading ability, then transpose with the four Kings. The signed Kings are placed in four different pockets, then instantly change places with the spectator’s signed Aces. Two variations included. A random card is selected using few rolls of the dice. After showing that your written prediction matches the selected card, you reveal the eerie truth that the trick never happened! A spectacular presentation piece based on the classic “MacDonald’s Aces.” Perfect for both close-up and parlor settings. A quick, visual opener where a pack of cigarettes instantly transforms into a deck of cards. An ingenious card revelation using a stress test card. Show a card in your pocket before it’s actually there. This simple, yet deceptive switch has several clever applications. A half-dollar and Chinese coin repeatedly travel and change places in this multi-phase coin routine. The spectator finds the only printed card in a completely blank deck. But just like an optical illusion, things aren’t always what they seem. The spectator’s card is seen in several places at the same time, finally appearing in a mysterious location. The spectator slowly cuts the four Aces into the deck. First they turn face-up, then they capture three selected cards. A great twist on a classic effect. The spectator marks dots on your business card, which VISUALLY reposition themselves to reveal a selected card. A wonderful close-up illusion. The magician tells a story about four artists and a blank canvas in this imaginative packet effect, which utilizes Peter Eggink’s “Ace Oddity” card. The spectator finds her card by doing a Google search with the deck. A novel spelling effect with a surprise kicker. The spectator plays the role of magician and finds the four Jacks without a clue how it was done! This novel presentation builds to a spectacular finish. In this extension of Aldo Colombini’s “Contact Colors,” the spectator plays the lottery by placing her dollar in the deck. Her luck keeps on riding to a million-dollar ending! Learn John’s clever method for pre-loading a bill in a fortune cookie. A quick in-the-hands transposition of two matchbooks. A clever way to turn your flash paper into a logical and visually-interesting prop.